For an architect, a pavilion means an opportunity to bring new ideas and technologies into architecture, explained Asif Khan, British architect who built Hyundai Pavilion installed at PeyongChang Olympic Plaza, Gangwon Province. “A butterfly’s beauty (the word pavilion stems from French word papillon meaning butterfly) is something related to its transitory existence, like temporary architecture,” Asif Khan said in an email interview with The Korea Herald. 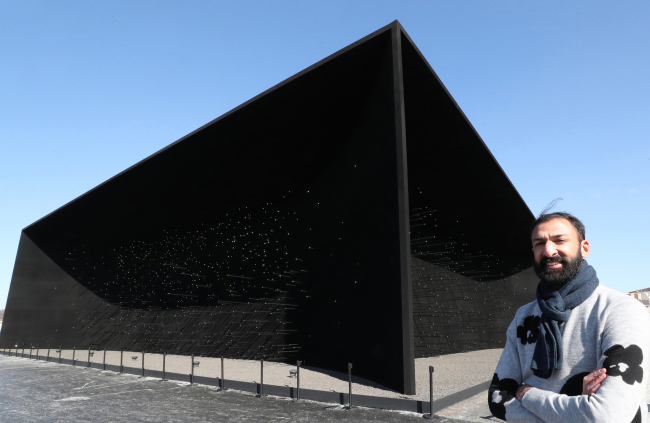 Also known as the ”darkest building on Earth,“ Khan’s pavilion is a temporary installation art that spans 1,225 square meters and stands some 10-meters tall, covered with sprayable Vantablack pigment, substance that absorbs more than 99 percent of light. A temporary installation it is, but the pavilion already eyes to log more than 30,000 visitors since its opening on Feb. 9. “When I work on a project, everything goes in, every last bit of energy. The reaction of the South Korean audience has given me all of that energy back,” Asif said. 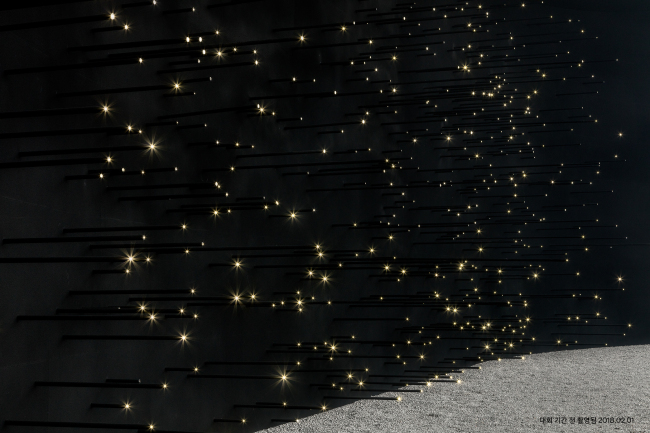 The pavilion asks the visitors to experience and ”harness darkness,” against the backdrop of snow-covered mountains and stadiums in PyeongChang. “Our earth has day and night, and our memories are a mixture of places and moments colored by the presence of light or darkness. Our physiology and culture is formed around these constants. Today the bright light from our mobile devices and constant illumination from our cities are becoming our new experience of the world,“ Khan said. “I think materials such as Vantablack could be a means to harness darkness just as we have learnt to harness light,” he said. Against the backdrop of the darkest dark, there are thousands of pinpricks of light on the end of rods that resemble stars in outer space. “The arrangement of stars on each facade is matched to the real stars you would see in each direction if you looked out into space. But because of the forward looking mobility theme of the pavilion, I thought we could do more. As the stars we see slowly change their location over the years, I realized that shifting the star map could be like looking into the future. So based on the data collected by the European Space Agency‘s Gaia mission, we let people experience a future sky for PyeongChang and for Korea,” Khan said. 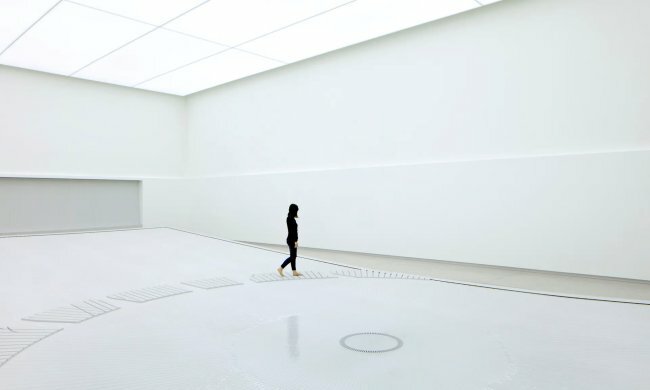 Inside the pitch-dark outer facades is a stark white room of a water installation, where 25,000 singular water droplets are emitted every minute to roll down into white acrylic tables. “I needed people to experience the contrast from darkness to light as a way of transcendence of place and time. To slow them down, to create a moment of a different pace at the Olympic park,” Khan explained the reason bringing such monochrome contrast into the exhibition. Khan also noted that he wanted to provide opportunities for visitors to have physical experience of hydrogen. “We coined the phrase ‘from stars to cars’ during our design process. The Hydrogen within a fuel cell electric vehicle, within every star including our sun and within every drop of water on Earth, is literally the same hydrogen which was formed at the birth of the universe,” Khan said. “We have made works which create new experiences or simulations of nature through architecture. Here the challenge was to take hydrogen and make it tangible,” Khan added. The pavilion installation initially started as a joint project with Korea’s largest carmaker Hyundai Motor Company, in an attempt to promote its brand and product. The pavilion exhibition will run through Feb. 25 and will be open again during the Paralympics period from March 9 to 18.